I love when my kindergartner comes home with artwork. 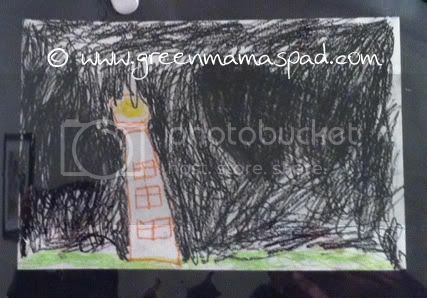 This is his drawing of a lighthouse. Wow! That is amazing for a kindergartener. I love that you said that you love it when they come home with artwork. I am a kindergarten teacher and I constant am getting slack for doing art projects instead of math or reading. We do over an hour of math and two hours of Language Arts and sometimes we need to create and be kids! super talented for a kindergartener! He's VERY good for a kindergartner. . . WOW! With those stormy skies, I have a feeling the lighthouse was in use that day! Wonderful! Oh my! What a talented little artist! Very nice work, especially for his age! Aw, what a great keepsake! I agree, kindergarten art work is the best! My son brings home the cutest stuff from his class too. Well done! You've got a little artist! great job! I would have known right away that's what it was, pretty good for a kindergartener. that is really good. I can actually feel the cold wind! Such a great picture, especially for a kindergartner! I loved saving pictures that the boys made at that age. I love kiddo art work! Great picture! That's really good! What a talented artist!